Well, it looks like I got my (very irritating) ABNA experience on the books just in time. The Amazon Breakthrough Novel Award is officially kaput, according to an announcement on the ABNA forums, and will be kinda-sorta-not-really replaced by the new Kindle Scout program. This fall we opened Kindle Scout as a reader-powered publishing platform that offers authors an opportunity to earn a guaranteed advance, a decision on publication in 45 days or less, the ability to retain print rights, and Amazon marketing for published books. Since launch, more than 20,000 readers have nominated the stories they want to see published and we have selected 16 original novels to be released early this year, with more chosen every week. In 2015 instead of hosting the Amazon Breakthrough Novel Award in its current form we will be using our new Kindle Scout program to discover and publish even more breakthrough novels throughout the year. Over time, we look forward to adding features to Kindle Scout and opening the program to even more authors and genres. Now, I’m no fan of the ABNA slaughterhouse, which starts with a lottery, moves on to the fickle finger of whimsical fancy, and ends with a bored Publisher’s Weekly intern slitting open your thorax and frying up your heart for supper. But for tens of thousands of people, the international contest is a yearly source of hope in a world that is mostly about crushing your dreams. ABNA cost nothing, was open to anyone in the world, promised big rewards, and perhaps most importantly, accepted novels that had already been self-published. Kindle Scout, Amazon’s new show-and-tell that looks primarily geared towards romance writers (but accepts a smattering of other genre fiction), still costs nothing. But it’s only open to Americans with American bank accounts, which has gotten a lot of foreigners up in arms. And most importantly, will only accept entirely unpublished manuscripts for consideration. This seems silly to me, considering what a huge player Kindle has become in the self-publishing world. Everyone uses KDP. Everyone is trying to grab a piece of the Amazon publicity pie. Everyone knows you really can’t get anywhere without Amazon’s blessing…yet books published through Amazon’s own self-publishing system are ineligible for Amazon’s own cash prizes? Step one: upload soul. Step two: cry. That’s why this Kindle Scout thing isn’t a direct replacement for ABNA. It’s also much, much more geared towards friend-farming than ABNA ever was. Kindle Scout relies on public votes to push books towards the finish line. So if you’ve got a massive Twitter following or a rabid Facebook hoard on your hands, you’re a million times more likely to succeed than someone who has written a damn good book but doesn’t have the social media savvy to get enough votes in 30 days to launch your submission into the top ranks (ahem…me). In general, I think it’s another one of those things that’s good news for Amazon and bad news for everyone else. Are we surprised? No, probably not. I wasn’t planning to enter the contest again, so it’s not too big of a disappointment for me. But what about you guys? Are you annoyed by this? Does Kindle Scout look interesting to you? Is it just another hollow promise on the part of a publishing goliath that chews up and spits out hard-working authors for fun? Are you going to submit stuff anyway? Let me know in the comments…even if you’re not American. I hadn’t really been up to speed with any of this (I got too preoccupied in getting my book printed to think much about Amazon’s self-publishing options), but it sounds like what you suggest – a friend-frenzy. I have 1,000 likes on Facebook, but I can guarantee that less than 1% of them would ever vote for my book (which, being published now, is of course inelegible). Sigh. I did ABNA for the first time the last year it was done, it seems. There was a lot I didn’t like about it, but as you say, it was free, and offered a spark of hope even for books that had been previously self-published. 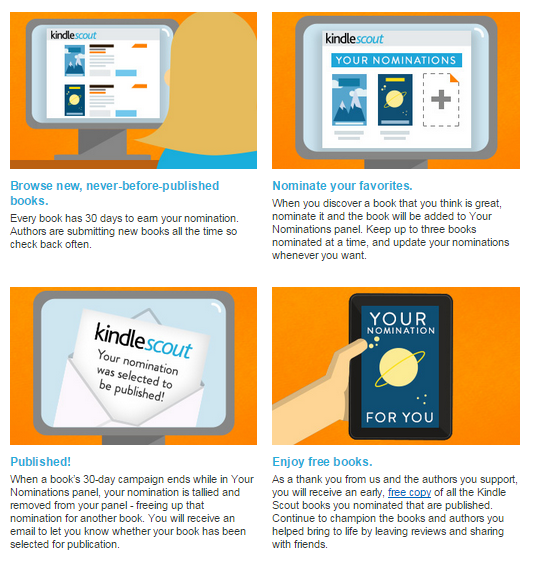 Kindle Scout looks more like an exercise in marketing to me. I’d rather spend that time writing. Your clearly right Chris. Some of us are not particularly interested in social media as a value determining factor. Politicians need that kind of love. Good article. The workings of this contest are a shame, but the entire publishing industry is more concerned with writers having a large Facebook or blog following than of the quality of their work. Well, I am a reader and Kindle and user. You would have expected Amazon to have pushed ABNA finalists in our direction. Or at least allow us to use ABNA as a search criterion on an actual Kindle. But no, if I want to find out which books even got through to the final of a final, I have to look everywhere online except Amazon. I can put Costa Award or Man Booker Prize or Pullitzer Prize and Amazon accepts that and returns a list but pay a top price for recent winners. In general, the way Amazon organise their fiction makes it hard to choose from a dedicated eReader that has no web to use. I honestly hadn’t even heard of the ABNA until I recently chose a book from the Prime Lending Library and found it was a recent winner of that award. And I wondered how that award was helping the author when the subsequent series was not added with a series page to Amazon Kindle and every single book in that series is free to download and borrow as part of prime. I love my Kindle, I really do and read 50 or more books a year, but some truly awful products (typos, anachronisms, plot confusion) get pushed my way. A lot of books are formula bound mild romance erotica. There are about 3 million Literary and Fiction titles that show up on my Kindle. I refined that number to erotica/romance and there were around 200,000 titles returned which is a big chunk. There were 18, 000 Time Travel books. We do need gatekeepers, but it seems a lot gets through. So people like me with not a lot of time to research or waste on reading duff samples do need to rely on social media to try and find books. Also, if you read some of the greatest classics ever written and knew nothing about them you would probably think the beginnings were boring based on the very brief samples you download for Kindle to try before you buy. I can see why agents want it made easier by having a gripping prologue or beginning. But the best books I have ever read did not have the most exciting of beginnings. And some of the worst showed promise then plateaued or deteriorated in the middle and never recovered. Any thoughts on Kindle Scout, the ABNA successor, which, in effect, inverts the initial exposure from unnamed Amazon Vine readers to everyone else? This is an interesting thread. My entry, The Reckless Orphan made it through far enough to get 2 reviews (one good, one bad) in 2014. The story is set in the UK, and other places, and I became aware that ABNA was really all about America. I made a note to set my next story in Broken Bow, Nebraska! Greetings! Just saw this post as I have a new novel ready and was wondering what happened to the Amazon Breakthrough contest. Sorry to see this competition over! In 2014, I made it to the quarters in with my thriller, The Overthrow. For the record, I thought the PW reviewer did an excellent job with my somewhat complicated story. I was just researching ABNA as a few years ago I made it to the quarterfinals with my fiction book, The DFC. Since that time, I have been editing/re-writing that novel, and also starting on a new novel, and was now beginning to look into possibly submitting it again to ABNA just to find out it no longer exists. It is disappointing to learn that the new Kindle format is more of a social media popularity contest than actual honest reviews of writers’ hard work. I am not a huge fan of social media and therefore do not have the thousands of “followers” it now appears would be necessary to push my novel, good or bad, to the forefront of the Kindle Scout program. Oh well, where there’s a will, there’s a way . . . Since my books are with an Indie publisher, the switch from ABNA to Scout leaves me out in the cold. Ah, well, probably wouldn’t have much of a chance anyway. There are better book award organizations to pursue. Someone wrote above ‘There were 18, 000 Time Travel books’. Gulp! I have two time travel novels in the works! Thanks for the article, I was thinking of submitting a chapter, but don’t think I will now. I’m not a big social media butterfly, and I have a Kobo Glo, which I love..